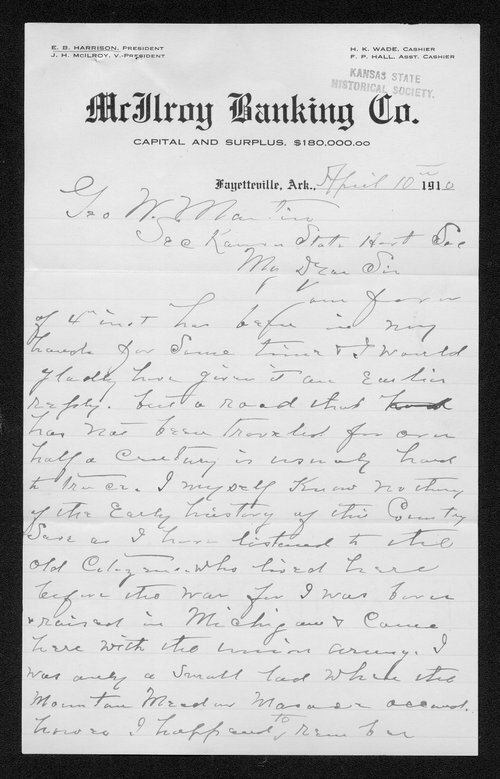 These letters, maps, and reminiscences relate to the Fayetteville road, also known as the Fayetteville Emigrant Trail. This trail started at Arkansas Post in Arkansas, then headed towards the northeast corner of Oklahoma, crossing the Neosho River, entering the state of Kansas in what is now Montgomery County. The trail crossed the Verdigris River about two miles north of the Kansas state line, went through the present-day site of Coffeyville making its way northwest, finally meeting with the Santa Fe Trail at Turkey Creek in McPherson County, Kansas. In total, this trail crossed the following Kansas counties: Montgomery, Chautauqua, Elk, Butler, Harvey, Marion and McPherson.